Pastor John MacArthur Teaches Works Salvation! He is the author of many books (most of which are published by Moody Press) including several full length commentaries on certain New Testament books. His local church is large, but his influence goes far beyond his local church because of his published writings and public tapes which are distributed widely. According to the flyleaf of his book, The Gospel According to Jesus, “He is heard daily on the national radio program “Grace to You,” and more than 7,000,000 of his audio cassette tapes have been distributed worldwide.” He is also the President of The Master’s College and Seminary. He is a member of the IFCA (Independent Fundamental Churches of America). 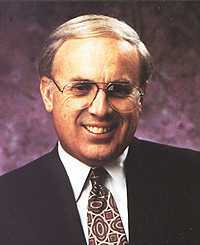 Dr. MacArthur is nationally known for his position in support of Lordship Salvation. Our desire is only to "prove all things", by testing all things by the Word of God, to see if they are true (1st Thessalonians 5:21; Acts 17:11). Dr. MacArthur's teachings have a worldwide impact, and his doctrines should not be embraced without subjecting them to the searchlight of the Scriptures. "Submission to the will of God, to Christ’s lordship, and to the guiding of the Spirit is an essential, not an optional, part of saving faith" (EPHESIANS, p. 249). "Saving faith is a placing of oneself totally in submission to the Lord Jesus Christ" (Romans 1-8, p. 205). Dr. MacArthur confuses repentance with the fruits of repentance, and confuses faith with that which faith ought to produce. He confuses saving faith (which takes place in a moment of time—Genesis 15:6; Ephesians 1:13) with discipleship (which is a lifelong process). As Miles Stanford has said, "Lordship salvation is not the childlike faith of John 3:16. It rightly insists upon repentance but wrongly includes a change of behavior IN ORDER TO BE SAVED. No one questions that there must be a sincere change of mind, a turning from oneself to the Saviour, but Lordship advocates attempt to make behavior and fruit essential ingredients of, rather than evidence of, saving faith" (Miles Stanford, in his review of The Gospel According to Jesus). MacArthur defines REPENTANCE as turning from your sins (Faith Works, pg. 74). He also teaches that true repentance "inevitably results in a change of behavior" (Faith Works, pg. 75). But is not TURNING FROM SINS a CHANGE OF BEHAVIOR? Is MacArthur confusing the RESULTS of repentance with REPENTANCE itself? Is not he confusing the FRUITS with the ROOT? MacArthur is more accurate when he says, "true repentance involves a change of heart and purpose" (Faith Works, pg. 75). The inner change will produce an outward change. REPENT! REPENT! REPENT! It's Not What A Sinner Must Do to Be Saved, But What Christ Has Done for Us! The simplicity of the gospel has been perverted in many churches today. Instead of RESTING in the finished work of Christ for salvation (Romans 10:3-4); churchgoers are being taught by John MacArthur, Kirk Cameron, Ray Comfort and Paul Washer that they must stop sinning to be saved. That is not Biblical! Jesus paid for our sins! "Let me just say simply, that when you present the gospel, all of this Lordship discussion aside, a presentation of the gospel is simply this: you are calling on someone to TURN FROM THEIR SIN and FOLLOW JESUS CHRIST. That’s it! Turn from your sin and follow Jesus Christ!....That is all we are asking: TURN FROM YOUR SIN AND FOLLOW JESUS CHRIST....What you talk to an adult about is the same thing you tell a child: you need to turn from your sin and follow Jesus Christ" (this is transcribed from a taped question and answer session given on 9/25/90 at the Calvary Baptist Church in Brewer, Maine, Rev. 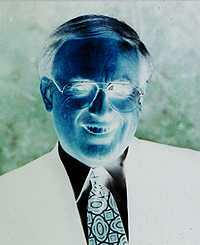 Larry Pawson, Pastor). Notice that MacArthur’s emphasis is upon WHAT MAN DOES (turning from sin, following Christ) rather than upon WHAT CHRIST HAS DONE. His emphasis is upon MAN’S COMMITMENT, rather than upon the Person and work of Christ and the response of faith to that Person and to His work. His emphasis is upon DO, but a true gospel message should emphasize DONE (John 19:30). It is not our COMMITMENT that saves us; it is CHRIST who saves us. Following Christ is a result of salvation, not a condition of salvation. Before we FOLLOW CHRIST in discipleship we must COME TO CHRIST for salvation. Before we COME AFTER CHRIST (Luke 9:23) we must COME UNTO CHRIST (Matthew 11:28). The term "BELIEVE" does not mean “turn from sin and follow Christ.” It means “trust fully, rely upon, resting one’s whole weight upon the WORTH, WORD and WORK of Jesus Christ.” We must not re-define saving faith to make it some kind of a “work-requirement” for salvation. Justification is for the person who “worketh not, but believeth” (Romans 4:5). In this passage, we read about a rich young man who asked Jesus how to have eternal life? When the young man bragged about keeping all of God's Law (which shows that he was self-righteousness), Jesus pointed out that he was covetous (which is a violation of the 10th Commandment in Exodus 20:17). Jesus used the Law the way it was intended to be used, i.e., to show us our sinfulness and need for a Savior. Romans 3:19, “Now we know that what things soever the law saith, it saith to them who are under the law: that every mouth may be stopped, and all the world may become guilty before God.” Jesus simply pointed out to that young man that he was not righteous in God's eyes. John MacArthur, Kirk Cameron and Ray Comfort all pervert this passage to mean that Jesus was giving a plan of salvation. Jesus WASN'T giving that young man a plan of salvation; but rather, was simply showing him that his self-righteousness was flawed and unacceptable to God. The Apostle Paul taught the same truth in Romans 2:13, because the Jews thought they could be saved by keeping the Law. No one can be saved by keeping the Law (Romans 3:20). We need Christ's righteousness, which MacArthur doesn't teach (Matthew 6:33; Romans 4:5-6; Romans 10:3-4; 2nd Corinthians 5:21). The rich young man in the Bible was covetous. According to MacArthur, that young man would have been saved if he'd denied himself, let go of his pride, pushed aside his selfish ambitions, given up his covetousness and given his life to Christ. John MacArthur is teaching lies of the Devil. Ladies and gentlemen, that is Catholic theology and damnable heresy!!! MacArthur said: “Coming to Christ means you give up the control of your life, and you yield it to Christ. That's what kept him from salvation, he was unwilling to do that.” The reason why the rich young man didn't get saved was NOT because he refused to yield to Christ, nor because he was unwilling to give up control of his life; the reason why he didn't get saved is because he was self-righteousness. The young man didn't ask how he could get to Heaven. No, rather, he asked what THING I NEED TO DO. Jesus knew the young man's heart. The young man was self-righteousness. Jesus used the Law to show the young man his wickedness. There was nothing he could do in his own self-righteousness to have eternal life. He needed Jesus as his Savior. Romans 3:19 and Galatians 3:24 plainly teach that the Law's purpose is only to show us our guilt of sin and need for a Savior. They all teach that the rich young man should have forsaken his covetousness to be saved. Kirk Cameron and Ray Comfort are going to be damned because they are following the false gospel of John MacArthur. The Bible plainly teaches that false prophets would go through pains to avoid being detected. Satan is subtle. 2nd Peter 2:1, “But there were false prophets also among the people, even as there shall be false teachers among you, who PRIVILY shall bring in damnable heresies...”The word “privily” here means “taking pains to avoid being observed; to lead aside.” This is the nature of false prophets. They are used by Satan to mislead people, going through pains to avoid being detected. Lordship Salvation is a backdoor approach to Works Salvation. Instead of requiring people to do good works to be saved as the Catholic Church does, Lordship Salvationists require people to stop living in sin to be saved. The result is the same—self righteousness. The perverted doctrine of Lordship Salvation is the primary ecumenical bridge now being used to merge Catholics with apostate Evangelicals. To understand the issue of Lordship Salvation, realize that THEY ARE ALL CALVINISTS!!! John Calvin (1509-1564) taught a heresy called the PERSEVERANCE OF THE SAINTS, which taught that if a person is truly saved they will continue in holy living, surrendering their life to Christ, and departing from sin and the world; thus, this becomes a REQUIREMENT to be saved in Calvinism. This is EXACTLY what Lordship Salvation teaches today (it is Calvinism). It is a false gospel. Contrary to MacArthur's claim, Pastor Charles H. Spurgeon DIDN'T believe nor teach Lordship Salvation. Salvation is either free-grace or works-based. There is no hybrid gospel that incorporates BOTH grace and works. Roman Catholics combine grace and works and pervert the gospel, leading souls into hellfire. If you add anything to simple childlike faith in Christ, then you have corrupted the simplicity that is in Jesus Christ (2nd Corinthians 11:3-4). MacArthur has attempted to misquote Charles Spurgeon; but as you will learn here, Spurgeon did NOT believe in Lordship Salvation. MacArthur and Ray Comfort teach that a person must have intent to reform or they cannot be saved. That is ANOTHER GOSPEL, a false gospel. Jesus gave all for us; He doesn't require us to give all to Him to be saved. There's nothing that we can do, nothing that God expects us to do concerning salvation, except to BELIEVE ON THE LORD JESUS CHRIST to be saved (Acts 16:30-31). It's not hard to believe! To teach that salvation comes from a life lived in obedience and service to Christ sinfully boasts that salvation comes from something that man does (Ephesians 2:8-9). Whereas Roman Catholics say to DO GOOD WORKS to be saved; Calvinists and Lordship Salvationists say to NOT DO BAD WORKS to be saved. BOTH are false gospels centering around WORKS for salvation, but Romans 4:5 tell us that salvation is to him that WORKETH NOT. The Bible says that salvation is “not of yourselves... not of works, lest any man should boast” (Ephesians 2:8-9). Plain and simple, John MacArthur is an openly admitted 5-point Calvinist, following the heretical teachings of John Calvin (1509-1564). In particular, it is the false doctrine of the PERSEVERANCE OF THE SAINTS upon which the Lordship Salvation heresy is based. Heretics like Paul Washer, Kirk Cameron, Ray Comfort and John MacArthur teach that if you don't stop living in sin, then you never got saved (in effect, they are adding the FRUIT of the Christian faith with the ROOT of our faith, which is a false gospel). The way a person lives has nothing to do with whether or not they believe on the Son of God. Eternal life is a free gift with no strings attached! The only way to genuinely know if a person is saved or not is by the direct testimony of their mouth. The Bible is filled with Christian believers who deliberately sinned horribly; such as men like king David stole Bathsheba in adultery and then murdered her husband to hide her pregnancy. Jonah ran from God Samson went with prostitutes. Rahab was a harlot. Isaiah was a man of unclean lips. Abraham and Sarah doubted God, and Sarah laughed in God's face. Peter denied and cursed in Jesus' name. Demas forsook serving God, having loved this present world. Calvinists are self-righteous hypocrites. God only saves sinners, the ungodly (Romans 4:5). Dr. John R. Rice (1895-1980) explains the difference between salvation verses consecration in this excellent article. Does not this formula indicate salvation by works? The Bible consistently teaches that salvation is not based on man's works, but on the Person and work of the Lord Jesus Christ. MacArthur states in HARD TO BELIEVE (pg. 93): “The life we live...determines our eternal destiny.” The implications of this statement are startling. If MacArthur's statement is true, then hell is going to be the eternal destiny of every human being! According to Romans 6:23 we have all earned for ourselves eternal death. The life we live does not determine our eternal destiny. “The point is not that God guarantees security to everyone who will say he accepts Christ, but rather that those whose faith is genuine will prove their salvation is secure by persevering to the end in the way of righteousness” (The Gospel According to Jesus [Grand Rapids: Zondervan, 1988], p.98). MacArthur's perverted gospel requires a person to make a continual effort to live above sin as part of salvation. If you claim to trust in Christ, but don't live holy and surrender your life to Christ, then MacArthur says you're not saved. That is a hellish false gospel that Ray Comfort, Kirk Cameron and Paul Washer all ascribe to. MacArthur is an unsaved Modernist at work corrupting the church. The Bible makes it clear that it is our relationship to the Saviour, the Lord Jesus Christ, or our lack of such a relationship, that determines our eternal destiny. In Matthew 7:23 Jesus says to a group of those professing salvation, “I never knew you; depart from me, ye that work iniquity.” They never had a saving relationship to Jesus Christ (John 17:3). God does not grant the sinner salvation based on the kind of life he lives, otherwise none of us would make it. Living the right kind of life is the fruit of salvation, but never the cause. MacArthur's wording seems to make it the cause or the condition of salvation, a teaching that would be totally contrary to the gospel of grace. Christ's work, though on behalf of man, was wholly His: glorious and perfect, yet to be received by man in its blessed results of eternal pardon, peace and blessing. To be received, we say, by simple Faith, unmixed with human effort. A humbling process, indeed! For man must go out of the righteousness-producing business, and rest wholly and forever on the work of Another, even Christ. (Hebrews, pages 238-239). John MacArthur is admittedly a Calvinist, who clearly teach the Perseverance Of The Saints. You don't have to PERSEVERE to be saved! The Salvation Army's official doctrinal statement teaches Calvinism. The Bible teaches the PRESERVATION of the saints, not the PERSEVERANCE of the saints. Those who think they must persevere in holy living to be saved, as Paul Washer teaches, are not saved at all. They are heretics! "Now let me say this and I don’t want you to panic when I say it. Saving faith is an ADULT ISSUE. Saving faith is an ADULT EXPERIENCE. Salvation is an ADULT EXPERIENCE. Am I saying that a child cannot be saved? I’m saying that salvation is a conscious turning from sin to follow Jesus Christ with an understanding of something of the sinfulness of sin, its consequences and something of who Jesus Christ is, what He has provided and that I’m committing my life to Him. At what point can a child understand that?... I tell parents that salvation is an adult decision... There is no illustration in Scripture of childhood salvation. There is none. People want to throw the Philippian jailer and his household; well that’s talking about his servants so there is no reference there about his children. So there is no such thing as a childhood conversion." In fairness, MacArthur is not saying that a child cannot be saved. But he does seem to be saying that if a child is to be saved he must understand as an adult, make an adult decision and have an adult experience. [The Lord Jesus taught that to be saved adults must become as little children (Matthew 18:3); MacArthur teaches that to be saved children must become as adults] How does this relate to His teaching on Lordship? If salvation is by simple child-like faith in the Saviour, then child salvation is no problem. On the other hand, if salvation involves obedience to Christ’s commands, surrendering to Christ’s Lordship, fulfilling the demands of discipleship, commitment of one’s life to the Saviour, etc., then salvation has become a very involved and complicated thing that would not at all be simple for a child to do. If we complicate the gospel with all kinds of Lordship requirements, then we have indeed made it very, very difficult for children (and for adults)! If we proclaim the gospel message that salvation is simply BY GRACE THROUGH FAITH (based upon the Person and work of Christ, not based upon sinful man’s fragile commitment), then this is a message that can be gladly received by people of all ages. There is a fine line between the turning from sin that genuine repentance brings; verses the turning from sin that false prophets require for people to get saved.